Today in Masonic History Charles Grandison Finney is born in 1792. Charles Grandison Finney was an American clergyman. Finney was born on August 29th, 1792 in Warren, Connecticut. Shortly after he was born his family moved to Jefferson County in upstate New York. Finney would never attend school. He did read law. Prior to passing the bar, he had a dramatic conversion and baptism into the Holy Spirit led him to give up his legal practice and preach the gospel. Starting 1825, Finney became active as a revivalist. He would preach around New York State, including in Manhattan. He would also preach in the Broadway Tabernacle. His sermons often included women praying out loud, which was uncommon at the time. He also created what was called the anxious seat, a place where people considering converting to Christianity could be prayed for. 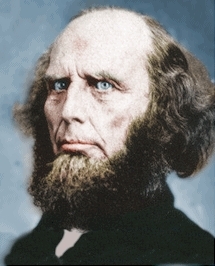 Finney was also part of the abolitionist movement. He moved to the free state of Ohio and worked with the Underground Railroad. He would also preach against slavery from the pulpit. In 1835, despite having no formal education himself, Finney became a professor at Oberlin College. In 1851 he became the president of the college. Under his tenure, Oberlin was the first college in America to admit black students as well as women into the school. Finney passed away on August 16th, 1875. Finney was a member of Meridian Sun Lodge No. 32 as a young man. After his conversion he decided to leave the fraternity because he felt it was in opposition to Christianity. He later was active in the Anti-Masonic movement.